Customer Service WOW!!! 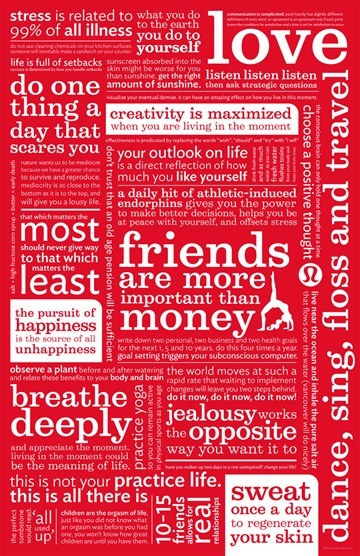 Lululemon Rocks! Those that know me best are well aware of my love for customer service. To give it, to receive it, to live it and breathe it, it is my passion, what drives me and recently I have learnt that customer service is my ‘Native Genius’. I absolutely love customer service, I seek it out, I am loyal to those that give it and while incredibly rare these days, I am truly blown away when I receive it. Well do I have a story for you!!! 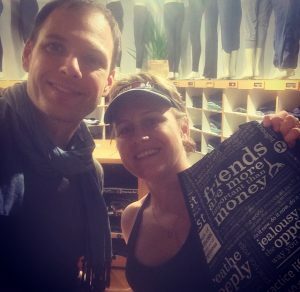 My friend Jess, the same friend who took the beautiful ‘before’ images of me prior to my bilateral mastectomy (you can read her beautiful blog here), recently showed off a pair of new lululemon workout pants at the gym. They looked amazing on her and she said that they were the most comfortable pants she’s ever trained in. I have to admit, I have never owned any lululemon items, so when Jess spoke so highly of these new tights, I thought I’d better check them out. So on the eve of Mother’s Day, off I went to the lululemon James St store, I had already justified to myself that I could spend some money guilt free as a Mother’s Day gift to myself. 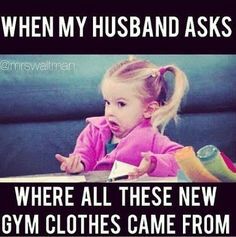 Afterall, I wear gym tights EVERY day, sometimes I even wear two pairs in a day. 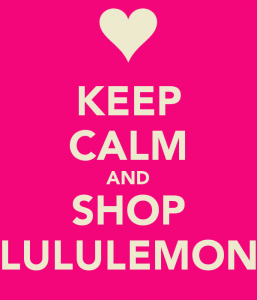 When I walked into the lululemon store in James St, I was immediately a little surprised to be welcomed by a man. It was relatively quiet, with about 45 mins until close for the day. He introduced himself to me, Cam was his name and Cam then directed me towards the pants that Jess owned. 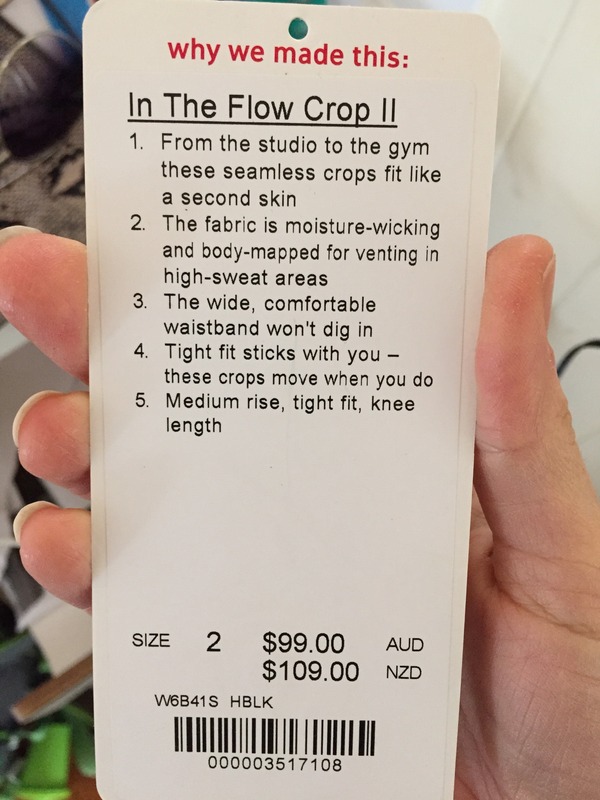 A big thank you to Jess for the picture she sent me of the tag from her pants. Cam and I discussed colours, he showed me the various options and I explained to Cam that I prefer darker colours to avoid that ‘crotch sweat patch’. I’m a sweater, a big sweater, I sweat as much as most men do and while it’s not something that bothers me, I am conscious of the fact that I look like I have pee’d my pants when I train. I was really testing his customer service!! I’m certain that by this stage Cam must have thought that I was amongst his most ‘weird’ customers. I mean seriously, why would a customer talk openly about crotch sweat? What had Cam got himself into? We picked out a few tops to try on with the pants and Cam directed me to the change rooms. I loved the fact that my name was written on the whiteboard on the change room door and I proceeded to try on the pants, along with a few tops to match. I spent a bit of time mulling over the options and I was instantly in love with the pants. What a great recommendation from Jess, I was SOLD!! I went in and out of a change room a few more times, trying on a couple more colours in the pants I loved and I had already justified to myself that I was going to buy two pairs. 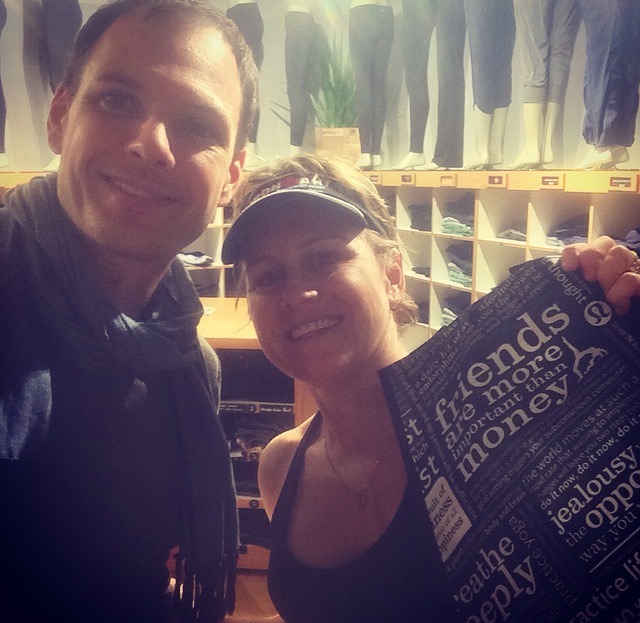 I sought out a top to match, and once again Cam offered his expertise and advice on some of the lululemon options. Cam pointed out a few sheer tops, the ones which would normally be perfect for high sweaters, they’re light and designed perfectly for people like me. The only problem for me is the ‘sheer’ thing! You see, I explained to Cam that I couldn’t wear sheer tops due to my recent bilateral mastectomy, I typically don’t wear crop tops when I train and therefore I need to make sure that the tops I wear aren’t see-through. Poor Cam, he must now be thinking that I am some kind of nutter!! By now I had tried on a few tops, decided 100% on the black pants and then tossed up in my mind as to whether I would buy the grey or navy pants as my second option. I looked at the clock, it was closing time and I was undecided. So I went to the counter, explained to Cam that I wasn’t yet decided on the second pair and that I’d be taking the black pair today. I was definitely going to come back another time to choose my second colour and I would also grab myself a top at the same time. 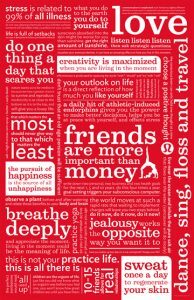 I had enjoyed my very first lululemon experience and looking forward to returning. Cam continued to engage in conversation with me and casually asked me which of the two colours (navy or grey) was I most leaning towards. It was a great question and made me think about it, as I explained to Cam that I think I’d go for the grey ones to step outside of my navy and black comfort zone. Cam was engaging and his customer service had me looking forward to returning again. 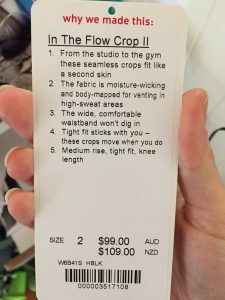 I love their slogans on the bags, I love their customer service, I love their comfortable clothing and I wear training gear more than I do regular clothes – so it’s easy to justify a return visit. He excused himself and stepped away for a few moments, returning with the grey pants from my messy change room floor. He then said to me “this is what I love about my job, I get to give you these pants”. What? I must have stood there in shock for a few moments, before saying “SERIOUSLY, you’re going to GIVE me the pants?”. The look on Cam’s face said it all!! He ripped the tag off the grey pants and he explained that this is his favourite part of working for lululemon. He was GIVING me the extra pair of pants as a gift. He was for real and Cam was as happy giving me the pants as I was to receive them. I couldn’t believe it!! WOW! Before I was the lucky recipient of Cam’s random act of kindness, I was already a new loyal lululemon customer, but after receiving his outstanding customer service, Cam has guaranteed it for life. In life there are many kinds of people, there are those that go quietly about their business, inspiring people from behind the scenes, then there’s those who prefer to shout it from the rooftop. 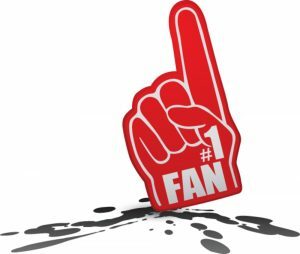 The world has a place for all of us, we’re all unique with our own style and my style is definitely to ensure everyone I know (and even those I don’t know) is made aware of this amazing “Raving Fans” customer service experience. Life’s too short to not celebrate moments like this. 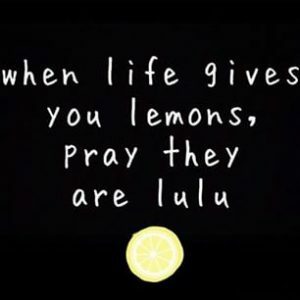 I am celebrating by wearing my new lululemon pants today, despite the fact that I don’t plan to go out and train. I am wearing them in honour of Cam in the lululemon James St store and I am excited to share this amazing and outstanding experience with as many people as I can. One thing is for sure, I’ll be back to buy myself some more lululemon clothes, I plan to spend some more time in store next time and I’ll be sharing my customer service WOW experience many times over for decades to come. I even managed a selfie with Cam before I left – he was simply AMAZING!! 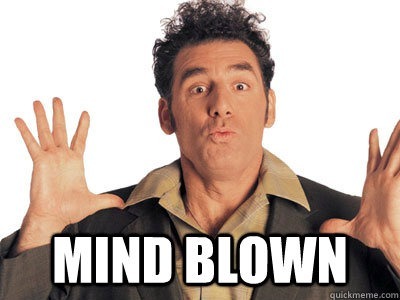 WOW, WOW, WOWEE!! I still can’t believe I was the lucky recipient of a random act of kindness, receiving a pair of lululemon pants for FREE from a complete stranger. It was unexpected, totally out of the blue and literally the most amazing customer service experience I have ever had in my life. Like it or not, I plan to tell the world! !